Premium baby & Kids furniture boutique based on King's Road in Chelsea, London. Many parents struggle to find quality nursery and children's furniture that’s unique & safe for their child. Our beautiful pieces are tailored to your personal style and made to the highest safety standards. This gives you a nursery room where your baby or toddler can sleep and play with complete peace of mind. We are proud to say that our products have found their way into the homes of many celebrities and royal households. In addition to the supply of premium furniture and room accessories, we offer a full interior design service for babies and children. Visit our showroom, shop online or call us to begin designing the perfect space for your little one. Boutique based in Gerrards Cross and Online Store dedicated to modern design. In our store you can find contemporary bunk beds, cot beds and cribs, all made in Europe, organic textile, chemical-free mattresses,wooden toys, kids clothing and gifts for the whole family. We like to work with small independent designers as well as reputable brands like Emeco, providing chairs and barstools to residential and commercial projects, restaurants, bars, offices. Other brands include Graypants, Oeuf NYC, Ferm Living, FabGoose, Perludi, IOKids Design. 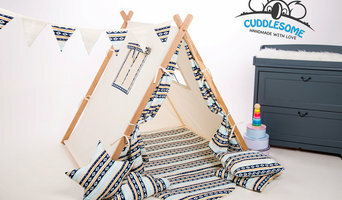 Cuddlesome, Family Business where we handcraft kids blankets, pillows, toys and other accessories. We use finest quality certified fabrics and anti-allergy filling. 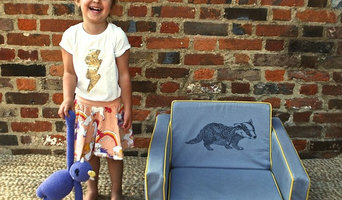 All our products can be Personalised with custom embroidery to make it yours. But there is much more than that, we are very passionate about what we do at proud of all our products. Soon you will be able to create your own fabrics to put personalisation to the next level. Keep your home looking sleek and stylish with the addition of Mini Sett's designer kid's mini flip sofa. Children love their own mini sofa for reading, resting and watching movies on, and are the favoured choice for stylish and fashion orientated parents. Monochrome teepees, accessories and interiors for the style conscious parent. Jack&Tara are proud to present an exclusive range of childrens homeware, designed by a London based creative team, and manufactured in Europe by skilled craftsmen. We offer an unparalleled level of quality, combining innovative production techniques with the finest methods, as well as a touch of the traditional! Our furniture is perfect for a family looking for something which not only suits their lifestyle, but which will last for years to come; something which, when children have long outgrown their childhood years, they will still cherish and which perhaps, they will even pass on to their own children. The unique, timeless and truly inspirational collection offered at Jack&Tara gives parents a way of personalising their childrens’ rooms, according to their taste and personality, without compromising on the overall aesthetic of your home. Here at Jack&Tara we are reinventing tradition, creating furniture which offers comfort alongside personality and style and which we hope will become charged with your children’s unforgettable memories. All of our furniture can be tailored to your family’s unique lifestyle, with an eclectic range of homeware, bedding, mattresses and much, much more… In a style that is uniquely Jack&Tara! Tidy Books makes original, award-winning storage designs for kids which are practical, stylish and foster children's sense of independence. The Tidy Books story began with 3 year old Adele who, one day, couldn’t find her favourite book on the shelf. When her mum, Geraldine set to work that night in her violin workshop in 2004, she began a business which embodies her belief that design for kids should be practical, ethical and beautiful. Tidy Books products are eco-friendly; they are made from sustainable wood with no MDF, and finished in our pioneering water lacquer which is safe for children and the environment. Tidy Books’ storage products look great in the home, and are because they are designed to be simple for children to use, they inspire children’s sense of independence. "I previously purchased a Book Box and have now purchased a Tidy Books Bookcase for my 2 year old little boy. What a hit! Bedtime stories took a lot longer than usual last night as he could see the fronts of so many books. Things he'd forgotten about were suddenly appealing. The products are lovely; well made, functional and so good looking. Beautiful products. I am very impressed." - Fiona, Tidy Books customer. At Anne Taylor Designs you will find a unique catalogue of personalised boxes, chairs, photo frames and personalised gifts . For Children we have an adorable collection of personalised toy boxes, chairs, photo frames, plaques and pegboards, all individually hand decorated on wood. For Dog Lovers, we have a collection of practical yet decorative home accessories, including mirrors and pegboards, to charm owners of all breeds. For Weddings and Anniversaries, we have a selection of personalised, monogrammed boxes in a choice of designs and sizes. Little Carousel Gallery is an online art gallery specialising in affordable and collectable fine art made exclusively for children. From paintings and limited edition prints to bespoke birth and Christening gifts, each and every piece is hand made by a talented children's artist or illustrator and personally selected for its potential to delight and inspire throughout childhood and beyond. Tidy Books makes original, award-winning storage designs for kids that simply make sense to kids. The Tidy Books story began with 3 year old Adele who, one day, couldn’t find her favourite book on the shelf. When her mum, Geraldine set to work that night in her violin workshop in 2004, she began a business which embodies her belief that design for kids should be practical, ethical and beautiful. Tidy Books products are eco-friendly; they are made from sustainable wood with no MDF, and finished in our pioneering water lacquer which is safe for children and the environment. Tidy Books’ storage products look great in the home, and are because they are designed to be simple for children to use, they inspire children’s sense of independence. "I previously purchased a Book Box and have now purchased a Tidy Books Bookcase for my 2 year old little boy. What a hit! Bedtime stories took a lot longer than usual last night as he could see the fronts of so many books. Things he'd forgotten about were suddenly appealing. The products are lovely; well made, functional and so good looking. Beautiful products. I am very impressed." Fiona, Tidy Books customer. Tidy Books preisgekrönten Bücherregale, Bücherboxen und andere praktische Aufbewahrungssysteme, machen Bücher für Kinder leichter zugänglich und fördern selbstständiges Lesen vom ersten Tag an. Die Tidy Books Geschichte begann mit einer verwirrten Dreijährigen, die eines Tages ihr Lieblingsbuch im Regal nicht finden konnte. Als sich ihre Mutter, Geraldine, in dieser Nacht in 2004 in ihrer Geigenwerkstatt an die Arbeit machte um Adele ein Bücherregal zu bauen, dass einen Sinn für sie ergibt, rief sie eine Firma ins Leben, die sowohl Wert auf Praktikabilität und Funktionalität als auch Umweltfreundlichkeit und Design legt. Tidy Books Produkte sind umweltfreundlich; Alle unsere Produkte bestehen aus Holz aus nachhaltiger Forstwirtschaft und sind mit unserem fortschrittlichen Wasserlack behandelt, der sowohl besser für die Kinder als auch für die Produzenten und die Umwelt ist. “Ich habe vor einiger Zeit schon eine Bücherbox bestellt und jetzt das tolle Bücherregal für meinen 2 Jahre alten Sohn. Was für ein Erfolg! Die Produkte sind wunderschön, von guter Qualität, sind praktisch und sehen einfach nur toll aus. Wunderschöne Produkte. Ich bin sehr beeindruckt.” – Fiona, Tidy Books Kundin. Tidy Books propose des meubles de rangement design et originaux pour enfants, faciles d’utilisation. L’histoire de Tidy Books commence avec Adèle, 3 ans, qui ne trouvait pas son livre préféré sur l’étagère de la bibliothèque. Quand sa maman, Géraldine, s’est mise au travail dans son atelier de violon cette nuit-là, en 2004, elle a commencé à concevoir une entreprise qui incarne sa vision de meubles pour enfants qui soient à la fois pratiques, éthiques et beaux. Les produits Tidy Books sont respectueux de l’environnement, fabriqués à partir de bois durable sans MDF, et terminé à l’aide de notre laque spéciale à base d’eau, sûre pour les enfants et pour l’environnement. Les produits de rangement Tify Books ont fière allure à la maison, et sont conçus pour être simple d’utilisation pour les enfants tout en leur apprenant à être indépendants. « J’avais déjà acheté une boîte à livres Tidy Books et ai maintenant acheté l’une de leur bibliothèques pour mon petit garçon de 2 ans. Quel succès ! Les histoires du soir ont duré beaucoup plus longtemps que d’habitude, comme il pouvait voir les couvertures de tellement de livres. Des choses dont il avait oublié l’existence devenaient subitement attrayantes. Les meubles sont adorables, bien fait et fonctionnels. Très beaux produits, je suis impressionnée. » Fiona – cliente Tidy Books. We love bright colours + bold prints. Preferably together! 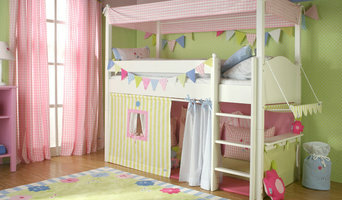 Antipodream brings you a range of exclusive products from some of the most exciting new brands in kids bedding and decor. We specialise in working with 'Antipodean' artists, designers and brands from Australia and New Zealand. Our first season features Kip & Co, Castle and Things, Bride and Wolfe, Mister Fly, Armadillo & Co, Pete Cromer and Printspace. The Antipodream collection focuses on bright colours, bold designs and print layering. Every item has been carefully selected with an eye for quality, durability and sustainability - allowing you to create spaces for your children which fit with your home, and importantly, that your kids will love. What can I expect from good Uxbridge, Greater London nursery designers, children’s decorators or kids’ furniture brands? Nursery designers should also help you understand when style gives way to practicality. Printed nursery wallpaper can make a great design statement but what happens if there is a spillage? Painted walls can be wiped clean and they don’t have to be neutral and bland. Ask about bold, bright colours, make use of fun stencils, or explore kid-friendly chalk paints. Avoid solvent-based paints; opt instead for the water-based variety. Similarly, Uxbridge, Greater London nursery designers will help you to see beyond the fantasy; that decorative bird house might look delightful mounted on the wall but is it an accident waiting to happen? They will ensure you avoid anything that dangles, wobbles, slips or trips. Can Uxbridge, Greater London kids room designers help me with my older child’s bedroom? If your children are a little older then kids room designers in Uxbridge, Greater London can still be very useful, assisting when you are ready to adapt your nursery into a child’s bedroom with a longer shelf life. They will be able to advise on a suitable colour scheme and design that won’t need constant updating as your child grows and can help you choose the right furniture to ensure that the space can be used for sleeping, studying and playing. They will be on hand to suggest the best toy storage solutions, multifunctional fitted study-beds and fun, themed furniture. Need to squeeze more than one child into a single bedroom? No problem, your Uxbridge, Greater London kids room designer will have nifty bunk bed ideas on hand to solve for both storage and personal space issues! If you’re looking for the best Uxbridge, Greater London nursery designers, decorators, children's showrooms and brands, Houzz is the place to start. Browse our Uxbridge, Greater London Kids & Nursery category in the Find a Pro section, and when you see a photo that you like, contact the relevant nursery or kids room designers to see what they can do for you.